I have been very busy collecting data for my Advanced Sonar DVD and my seminars. I couldnt resist sharing some interesting photos collected by Warren Parsons. Warren has been collecting data for me. Warren found a sunken ice fishing house. In Minnesota ice fishing is huge with large wooden ice houses found everywhere on the ice. Sometimes our weather melts the ice when we dont expect it and someone lost their house. We dont know when or who lost this one. The underwater photos are collected with the Aqua-Vu DVR. It is very easy as it records to the same SD memory card that I use in my Lowrance. 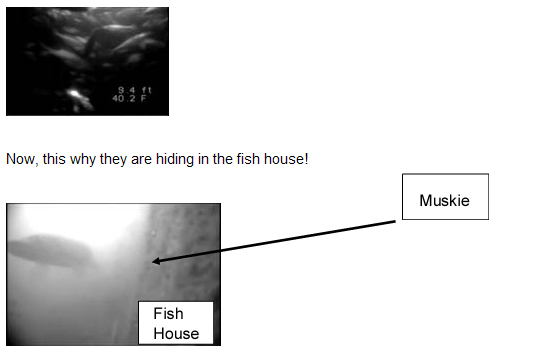 The sonar picture is from a Lowrance 113, opened in the SonarViewer, and a screen capture of part of the recording. Warren placed the Aqua-Vu underwater camera inside the fish house. 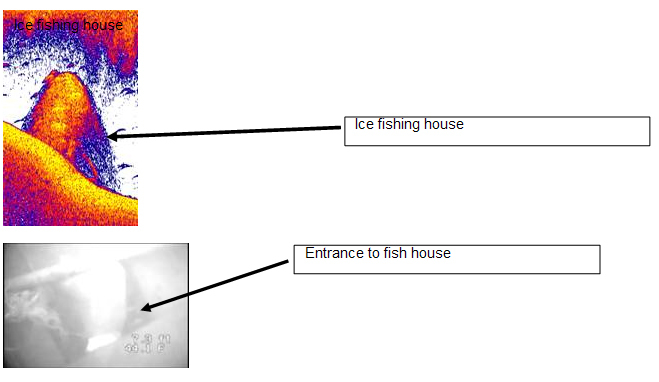 Now you see why I call it the fish house instead of an ice fishing house. As you rotate the camera there are fish everywhere. I have collected lots of underwater video with my MAV Aqua-Vu and the log chart feature of my Lowrance to use this winter. This one was so interesting that I couldnt hold back! Thanks to Warren for his hard work. Warren is my map guy who finds all the great aerial photos and topographic maps for my tournament fishing. Go to www.accuemap.com for some examples he has posted. If you are looking for top notch guide service, I have friends that guide in these areas. I highly recommend them for a quality trip. Go to http://www.hightechfishing.com/guide.html for contact information. Enjoy your winter and dont forget to use the free time to learn!